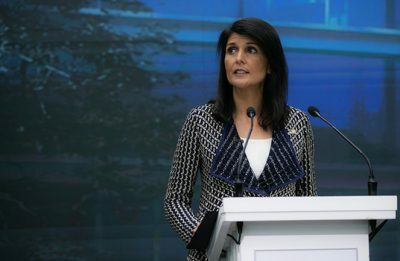 The United States is going to stay in the 2015 Iran nuclear deal despite President Donald Trump’s move not to recertify it, says US Ambassador to the United Nations Nikki Haley, asserting that Iran is not in breach of the agreement. “I think right now you are going to see us stay in the deal,” Haley told NBC News on Sunday, two days after Trump’s refusal to certify Tehran’s commitment to the landmark agreement between Iran and six world powers— the US, UK, France, China, Russia and Germany. Under the deal, known as the Joint Comprehensive Plan of Action (JCPOA), Iran agreed to limit parts of its peaceful nuclear program in exchange for removal all nuclear-related sanctions against the country. The Republican president has been desperately trying to undo the agreement, which prevents him from adopting harsher policies against the Islamic Republic. In his speech on Friday, Trump accused Iran of committing “multiple violations of the agreement,” a claim repeatedly rebuked by the International Atomic Energy Agency (IAEA), America’s European allies and even officials within his own administration. The billionaire-turned-politician added that he would no longer make regular certifications that the lifting of sanctions under the deal had been in US interests. In a separate interview with ABC News, the UN ambassador was struggled to give a clear response when asked whether “decertifying” meant Iran was in breach of the JCPOA. “No, decertifying implies that all of those other things that are in the UN resolution are not happening, “Those are total violations,” Haley said, referring to the UN Security Council Resolution 2231 that endorsed the deal. She did not clarify what parts of the resolution had been violated. The Trump administration says Iran’s development of ballistic missiles for defensive purposes and its support for “terrorist groups” amount to violations of the nuclear deal.